Today we mourn the passing of a great man and a proud American who put God, Country, and Family above all else. George H. W. Bush was widely respected for his leadership and authenticity in a bipartisan manner because it was clear he cared about our country and the vital role we play in the world. Like many presidents he did more than he received credit for, and his pragmatic approach to domestic affairs helped lay the foundation for future success. He invested in technology, helped overhaul clean-air laws and supported civil rights measures that helped our nation progress. While not everyone may agree with policy decisions, it’s safe to say that people on both sides of the aisle respected George H. W. Bush. With his passing I’m reminded of a time when the politics of this country weren’t so divisive and intense, and I pray we can return to being more sensible and respectful of opposing opinions. With the passing of former president George H.W. Bush, I’m reminded of just now much the world has changed since he left office – and while the world may face new challenges today, I feel we could all stand to learn from the way he approached problems in a sensible, logical, and bipartisan approach. Many of us remember the way Dana Carvey lampooned him mercilessly on Saturday Night Live with hilarious impressions of our former commander in chief – but I think the fact that these two men formed a bond and became great friends also shows the type of person George H. W. Bush was. He didn’t take himself too seriously, yet was also the most powerful man in the world at one point – that’s a trait that can’t be applied to many people. 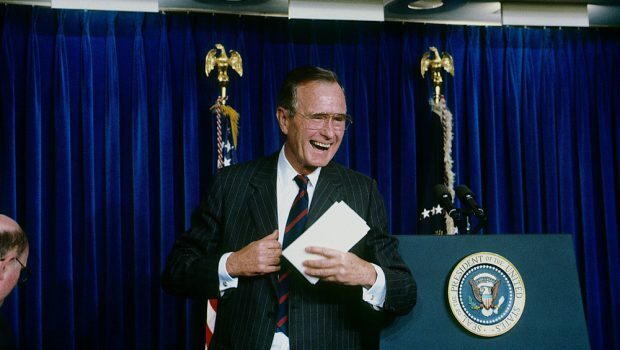 Bush was also known as being a prodigious Thank You note writer, which I feel is a lost art in many ways as we take so many things for granted in our fast-paced modern life. I think that also reinforces that fact that he was a man who appreciated the power of the office he held, but also appreciated the important of not considering yourself more important than the average citizen. This was, after all, one of the first presidents to order his secret service convoy to stop at stoplights – like a regular person. One of the things I always appreciated about the elder Bush was the way he embraced life after office and really made the most of his dash with adventures and activities that would wear out a younger man. He made the most of his dash and left a tremendous impact on the world in the process. He was a statesman and a hero to many who deeply cared for his family and country, and brought a great deal of honor and respect to the office of the presidency. I pray he finds peace in heaven and is reunited with his wife Barbara. Rest in Peace!